Represents the kind of DeviceInformation object. The DeviceInformation object represents a device association endpoint (AEP). AEPs usually represent a device discovered over a wireless or network protocol. Some of these endpoints can be used without needing to first pair the device. Use CanPair to determine if a device supports pairing and IsPaired to determine if a device is already paired with the system. Only AssociationEndpoint objects have a non-NULL value for Pairing. For more information about pairing over a network, see Enumerate devices over a network. An AssociationEndpoint object is a child of a single AssociationEndpointContainer object and can contain 0 or more AssociationEndpointService objects. The DeviceInformation object represents an association endpoint (AEP) container. An AssociationEndpointContainer object represents a single physical device that might have more than one AssociationEndpoint objects associated with it. For example, if a television supports two different network protocols, the AssociationEndpointContainer would be the television. It would also have two AssociationEndpoint objects to represent each protocol. The Id for this object is the AEP container GUID as a string. The DeviceInformation object represents an association endpoint (AEP) Service. An AssociationEndpointService object represents a functional service contract exposed by the device. Not all protocols support AEP services. An AssociationEndpointService can have a single parent AssociationEndpointContainer object. The Id for this object as a string. The DeviceInformation object represents a device object. This could also be referred to as a devnode. These devices are objects that represent a piece of the device functionality and optionally have drivers loaded on them. When a physical device is paired with windows, multiple Device objects are created for it. A device contains 0 or more DeviceInterface objects, is a child to one DeviceContainer object, and is related to 0 or 1 AssociationEndpoint objects. The Id for this object is the device instance id for this object. The DeviceInformation object represents a device container. 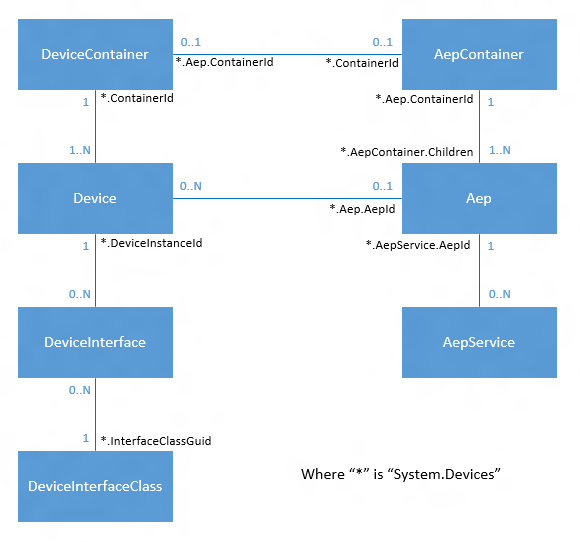 DeviceContainer objects describe a collection of device objects that exist in the same physical device. For example, a multi-function printer may have several different devices included, but they would all exist as part of the parent DeviceContainer object. The Id for this object is the device container GUID as a string. The DeviceInformation object represents a PnP device interface. These are exposed by device drivers to enable an app to talk to the device, typically using device IOCTLS (input output controls). This type of DeviceInformation object contains all the properties of the PnP DeviceInterface object plus some properties from the parent PnP DeviceContainer object. This combination of properties can be presented to the user when the user needs to select a device to complete an app scenario. A DeviceInterface object can only be a child to one DeviceContainer object. This is the default DeviceInformationKind when enumerating devices without specifying a specific kind. The Id for this object is the device interface id, or the device interface path. The DeviceInformation object represents a device interface class. Every DeviceInterface object belongs to a certain DeviceInterfaceClass. This is similar to a contract definition. These contracts are represented with an id and properties, just like every other PnP object. DeviceInterfaceClass objects contain little more information than a unique identifier and possibly a name. The Id for this object is the device interface class GUID as a string. The DeviceInformation object represents a single physical face of a device enclosure. The object is of an unknown type. This value is not used. A DeviceInformationKind value can be passed to the various enumeration APIs to indicate the specific kind of device you want to enumerate. In most scenarios, you will receive the DeviceInformation from the device selector. To see how to enumerate over specific kinds of devices using DeviceInformationKind, see Enumerate devices. The following diagram show how the different device types interact with each other. It also indicates the properties that tie the relationships together. For performance reasons, many of the relationship connections only go in one direction. The exception to this is AepContainer. It contains a list of its child objects thanks to AepContainer.Children.